Evgeni Plushenko of Russia defended his World title in the Men’s event, winning his third gold medal. France’s Brian Joubert won silver while Stefan Lindemann of Germany won the bronze. The men’s event began with the Qualifying Rounds which account for 20 percent of the final score. The short program is worth 30 percent while the long is worth 50 percent. The top 15 skaters from each qualifying group advanced to the Short Program. Canada’s Emanuel Sandhu landed a quadruple toeloop-double toeloop combination, but fell on the next element, a triple Axel. The 2004 Four Continents silver medalist recovered to land a triple Axel-triple toeloop combination, a triple flip-triple toeloop combination, and two more triple jumps, earning marks from 5.5 to 5.8 for a first place finish in his group. Joubert landed a quadruple toeloop followed by a triple flip, a triple Axel, and a triple flip-double toeloop combination. The 2004 European champion landed four more triple jumps to earn marks from 5.1 to 5.8 for a second place finish in his group. Switzerland’s Stephane Lambiel put a hand down on his opening jump, the triple Axel, but recovered to land a quadruple toeloop followed by a triple flip-triple toeloop and a triple Lutz-triple toeloop combination. The 18-year-old landed two more clean triple jumps to earn marks from 5.1 to 5.7 for a third place finish in his group. Frederick Dambier of France, who is struggling with a back injury, landed a quadruple Salchow and finished fourth in his group. China’s Chengjiang Li landed a quadruple toeloop-triple toeloop combination to place fifth in his group. Plushenko opened his routine with a quadruple toeloop-triple toeloop combination followed by a triple Axel, a triple Axel-triple toeloop combination, and a triple Lutz. The 2002 Olympic silver medalist landed two more clean triples to earn marks from 5.8 to 5.9 for a first place finish in his group. Klimkin landed eight triple jumps in his routine, including a triple Axel-triple toeloop combination. Despite some shaky landings, the 2004 European bronze medalist earned marks from 5.2 to 5.8 for a second place finish in his group. Lindemann landed a quadruple toeloop-double toeloop (hand down after the quad) followed by a triple Axel-double toeloop combination, in his performance. Although the 23-year-old fell out of a triple Axel and doubled a flip, he landed four more triple jumps to earn marks from 5.0 to 5.7 for a third place finish in his group. Min Zhang of China landed a quadruple toeloop and Salchow to finish fourth in his group. USA’s Michael Weiss two-footed his quadruple toeloop (in combination with triple toeloop) and finished fifth in his group. Plushenko opened his Tango and Flamenco routine with a solid quadruple toeloop-triple toeloop combination, followed by a high triple Axel. Though the Russian champion pitched forward a bit on the landing of his triple Lutz, he received marks ranging from 5.7 to 5.9 for a first place finish in the short and overall. Joubert opened his program with a quadruple toeloop-triple toeloop combination, holding onto the landing of the quad, followed by a triple Axel and footwork into a triple flip. The 19-year-old earned marks ranging from 5.6 to 5.9 for his performance to Time by Pink Floyd, placing second in the short and overall. Skating to music from the Earnest soundtrack, Lindemann opened his program with a quadruple toeloop-triple toeloop combination followed by a triple Axel and a triple Lutz. The German champion earned marks from 5.5 to 5.8 for a third place finish in the short and overall. Skating to Jean Sibelius’ Valse Triste, Weir opened his dramatic short program with an easy triple Lutz-triple toeloop combination followed by a triple Axel and a triple flip. The 2004 US champion earned marks ranging from 5.0 to 5.7, placing fourth in the short and sixth overall. In his militaristic program to Henry V, Weiss executed a quadruple toeloop-triple toeloop combination, two-footing the landing on the quad in what was originally planned to be a triple flip-triple toeloop combination. The two-time World bronze medalist then landed a triple Axel followed by a triple Lutz to earn marks from 4.9 to 5.8 for a fifth place finish in the short and overall. Lambiel executed a triple Axel in the opening of his routine to Vanessa Mae’s I’m a Doun, but fell on the quadruple toeloop. The Swiss champion landed a triple flip and displayed good footwork and spins to earn marks ranging from 4.8 to 5.8 four a sixth place finish in the short and fourth overall. Sandhu, who had placed first in his qualifying group, was 13th in the short. Performing his tribute to Vaclav Nizhinski, Plushenko opened with a quadruple toeloop-triple toeloop-double loop combination followed by a quadruple toeloop. The two-time and reigning World champion went on to execute two triple Axels, one of which was in sequence with a triple flip, and two more triple jumps. Though the 21-year-old fell on the take off for a triple loop, he recovered quickly to finish with two spins, earning marks from 5.8 to 6.0 for a first place finish in the long and overall. Joubert opened his Matrix routine with a quadruple toeloop followed by a triple flip and a triple Axel. The French champion went on to execute a quadruple toeloop-triple toeloop combination (turning out of the triple) and three more triple jumps to earn marks from 5.6 to 5.9 for a second place finish in the long and overall. Performing to Joe Hisaishi’s Le Petit Poucet, Lindemann opened with a quadruple toeloop-triple toeloop combination (hand down on the quad) followed by a triple Axel-triple toeloop combination. The 2000 World Junior champion went on to land five more triples to earn marks ranging from 5.6 to 5.9 for a third place finish in the long and overall. Lambiel, who’s routine featured two quadruple toeloops, one in combination with a triple toeloop (falling out of the triple toeloop), opened with a triple Axel. He went on to land five more triple jumps, earning marks from 5.6 to 5.9 for a fourth place finish in the long and overall. Weir didn’t attempt a quadruple jump, but landed eight clean triples to earn marks from 5.3 to 5.8 for a fifth place finish in the long and overall. Weiss finished sixth overall followed by Min Zhang of China, who was seventh. Klimkin, who placed ninth in the short program, had to withdraw before the Free Skate due to a torn hamstring. 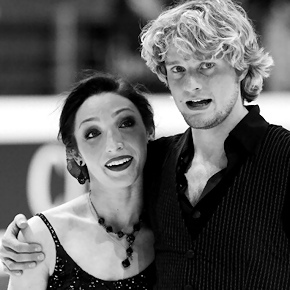 More on Meryl Davis and Charlie White in the GS Forum.